Officers in Kincardine and Mearns charged 13 people following a three day operation last week targeting road safety and vehicle offences in the area. The three day operation was held from Saturday May 27 to Tuesday May 30 and focused on high visibility patrols, and the education and enforcement of road traffic legislation. The operation targeted roads in and around Stonehaven, the main towns of Laurencekirk, Portlethen plus communities such as Banchory Devenick, Durris and Drumoak. It included the A90, A92, Netherley Road, Slug road, Charleston flyover, plus various unclassified roads in the Kincardine and Mearns area. Officers from the Kincardine and Mearns community policing team, assisted by officers from the local roads policing Department and Special Constables, worked on the initiative, which resulted in 47 vehicles being stopped. As a result of the operation 13 people were charged in connection with various traffic offences, including speeding, failing to wear seatbelts, and driving without valid MOT test certificates. One of the 13 people charged was a 57 year old female who was stopped and found to be driving over the legal drink drive limit. She was arrested and charged regarding the offence. In addition, 23 people were educated or warned regarding minor Road Traffic offences. 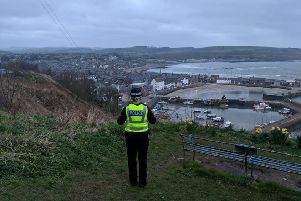 Uniformed patrols were also carried out in and around the AWPR sites in Stonehaven and Portlethen to educate drivers there, due to the increased road use around these areas since works began. PC Kennedy from the Kincardine and Mearns Community Policing Team who led the Operation said: “This initiative allowed us to reinforce and re-educate people about the importance of safety on our roads. It was also carried out to reassure the public that we will actively pursue offenders to deter road crime across the area. Anyone with information can contact local Officers via 101 or report anonymously via Crimestoppers, who are independent from the Police, on 0800 555 111.